A period of very intense rainfall associated with a Narrow Cold Frontal Rainband (NCFR) appears to be the primary meteorological trigger for the deadly and destructive post-fire debris flow in and below the Thomas Fire burn area. When a watershed experiences sufficient burn severity during a wildfire, water repellent soils can develop. 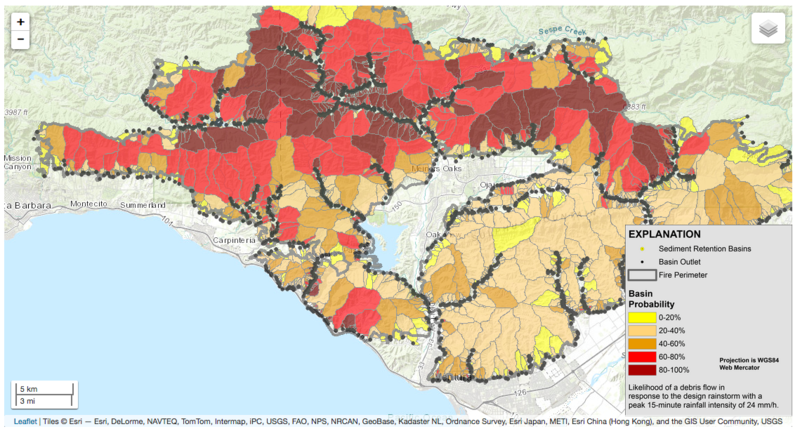 Rainfall runoff is dramatically increased in these areas as compared to unburned areas. When intense rainfall occurs over the burned watershed, progressive bulking of sediment and debris (ash, rock, burned vegetation) occurs due to the increased runoff, and this debris is mobilized downstream. No antecedent rainfall is necessary for post-fire debris flows. In contrast, landslides (like the deadly La Conchita event that struck nearby in 2005) require sufficient prior rainfall to saturate the soil. The broader, ¬two-day long, storm, within which the NCFR occurred, included a weak-to-moderate atmospheric river and a closed low-pressure system. However, it appears that a narrow, localized band of heavy precipitation along the cold front that passed after the AR, played a primary role in triggering the debris flow. Figure 1 shows the likelihood of debris flow occurrence with a design storm for the Thomas Fire. The area above Montecito was evaluated as having a high likelihood of debris flow with the design storm (peak 15 min intensity of 24 mm/h rate, or about 0.25 inches in 15 minutes). Figure 2: Looking towards burn area in Montecito. Roads have become debris flow paths and houses destroyed. Photo: Ventura County Air Unit. As of 15 January 2018, reports indicated 20 deaths, and more remained unaccounted for. Many homes, businesses, and vehicles were damaged or destroyed. Highway 101 is not anticipated to open until at least January 22, an additional week after the initial estimate of January 15. Debris from the debris flow traveled all the way from the burn scar in the mountains to the ocean. Figure 3: Narrow Cold Frontal Rainband that produced high intensity rainfall. A Narrow Cold Frontal Rainband (NCFR, Figure 3) is a narrow band of intense convection and heavy rainfall along a cold front. An NCFR formed offshore and made landfall at Pt. Conception just after 1 am PST on the 9th. As the NCFR interacted with the land surface and the terrain, it temporarily weakened, broke up, and strengthened again within the Southern California Bight. The NCFR brought high intensity rainfall to the westernmost part of the Thomas Fire burn area around 4 am PST. Figure 4: Closed low and a double-banded atmospheric river at the time of event (12 UTC/4 am LST 9 Jan 2018). 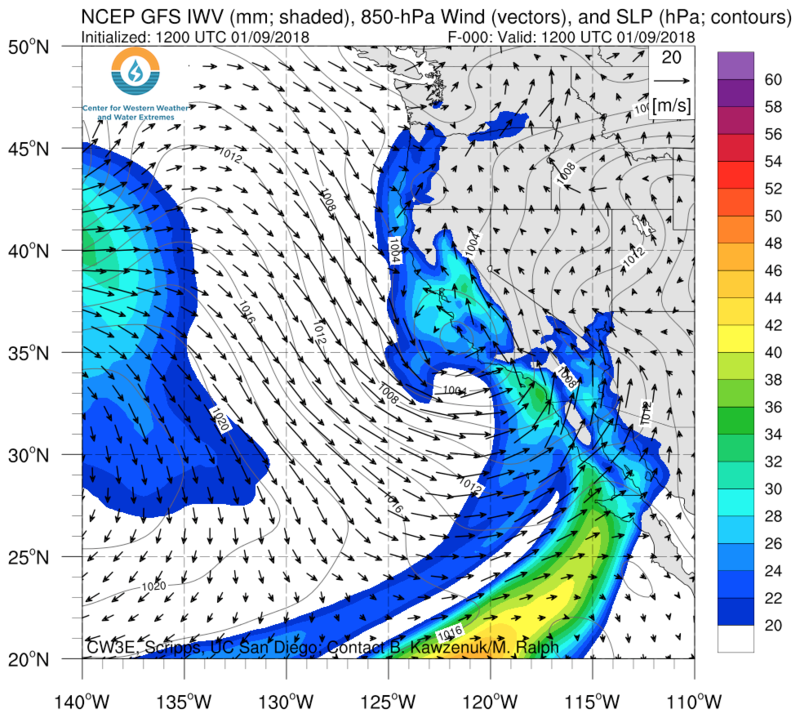 This event featured a north-south oriented atmospheric river with two moisture bands interacting with a closed low-pressure system (Figure 4). The main AR had moved southeast by the time of the debris flow event. While the NCFR drove the high rain rates that produced the debris flow, the AR helped transport moisture into the area. Figure 5: Total storm rainfall and precipitation intensity for stations near and within the burn area. Rainfall rates shown are for a 15-minute interval, and are distinct from the 15-minute maximum. Rainfall total image: CNRFC. Rainfall intensity data: SBCPWD (https://rain.cosbpw.net). Across the Santa Ynez and Topatopa Mountains, approximately 2-5+ inches of rain fell over a 2-day period. This is a moderate storm for the region in terms of precipitation totals. However, the NCFR produced periods of intense rain. The 15-minute rain rates observed at several locations correspond to a 25-50 year event according to NOAA Atlas 14. Carpinteria FS (not shown) reported a 15 min total of 0.86 in, which corresponds to a 100-year event. Figure 6: Debris flow following Coyote Fire in 1964. Image shows corner of San Ysidro and East Valley Rd in Montecito. Photo credit: “John Bartholomay’s father” (via Facebook). 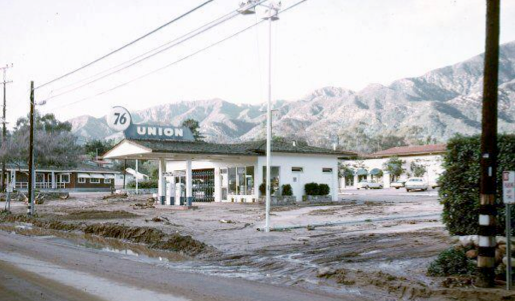 Post-fire debris flows are relatively common in the area; in 1964, Montecito experienced a damaging debris flow after the 1964 Coyote Fire (Figure 6). Post-fire debris flows and their driving atmospheric features have been catalogued in Oakley et al. (2017). A 10-year study by Young et al. (2017) identified that 50 of 57 cool-season (Oct-Mar) debris flows in California, inclusive of those occurring in both an unburned and post-fire setting, occurred on the day or day after a landfalling AR. 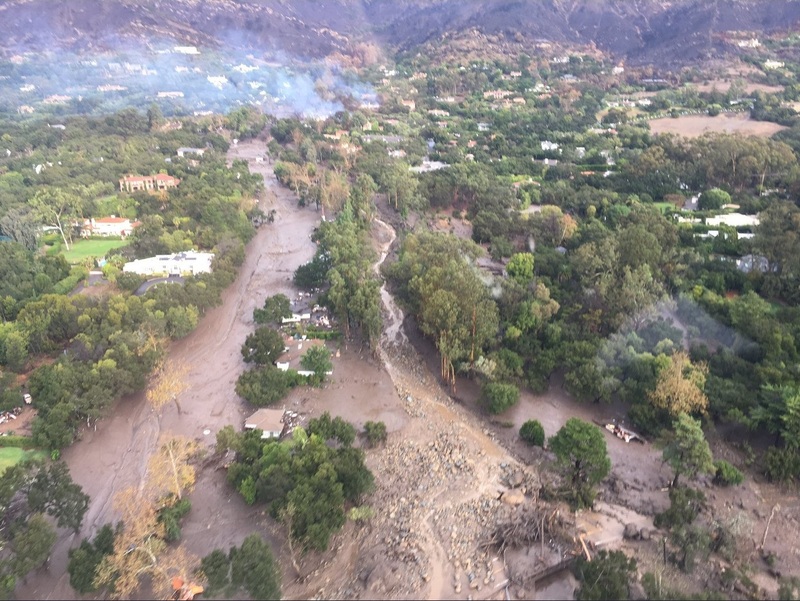 Fifteen of 25 of these debris flows occurred over southern California on the day or day after a landfalling AR; data derived from their Figure 2. These studies were based on research supported by California’s Department of Water Resources and the Center for Western Weather and Water Extremes in collaboration with the USGS and California Geological Survey in an effort to better understand the role of atmospheric rivers and cut-off lows in creating debris flows and landslides. This storm event has similar characteristics to other storms that have impacted Santa Barbara County. One well documented event was on 3 February 1998 (Neiman et al. 2004), which also documented a landfalling atmospheric river followed by a convective line (NCFR) that produced roughly 0.5 inches of rain in 10 minutes.